What is Small Business Air Fiber Internet service? Suitable for small businesses with light needs and typically under 10 computers. It is a high speed, low latency Wirelessly provided Internet access service. Service is provided from towers, tall buildings and mountain tops to your location via a small lower power radio and antenna. It’s very similar in performance to ADSL2+ or cable broadband service in experience, but available in areas that those services are poor or not available. 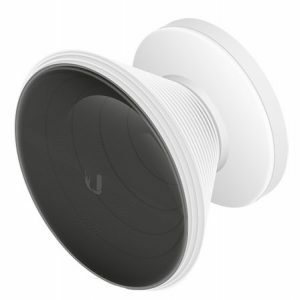 It is a wireless technology optimized for outdoor environments and not WIFI but related in how it uses similar frequencies. Download email attachments faster, get smooth web meetings, watch your video, use business VOIP phones, View video cameras, use the latest cloud applications and more with a high speed Business Air Fiber Internet service from Succeed.Net. This is a shared best effort type Internet service like DSL and Cable where you get top speeds most of the time. If you want guaranteed reliability, speeds, latency, repairs and priority support choose our commercial grade service. *Pricing is shown for 2 year commitment contract terms. Month-to-Month pricing is available at higher rates. Pricing does not include fees or taxes. *Terms: All speeds listed are “up to” the maximum listed and may vary during time of day. We may employ bursting to give you max speeds most of the time unless you have sustained large downloads or streaming over time but we still give you enough to sustain HD streams based on plan description. Unusually long Distances, tree growth, extreme weather, radio interference and other factors out of our control can affect the maximum or average speeds you will receive. All residential and small business services are best effort and not guaranteed the same as typical DSL and Cable internet services. Data caps are monthly and overages are charged .50 per GB. Less than 1% of our users exceed caps. Not all speeds available at all locations as limited top speed slots fill up. *One AP suitable for for up to 1,800 sq ft office, larger offices typically require multiple Access points for proper coverage. What is Symmetric Air Fiber Internet Service? Symmetric Air Fiber Internet service is a business grade Internet service for businesses that need guaranteed reliable internet and need faster upload speeds for use of VPN’s, VOIP Telephone, Video cameras, frequent large uploads, and require a quality of service SLA (Service Level Agreement). It is similar to Metro Ethernet service or Small Business Fiber Optic and has higher reliability and guarantees than any Cable TV based internet service. It includes Priority traffic and QoS over Small Business accounts. Is the better choice for 10-50 computer networks. For even larger networks look at our Dedicated Air Fiber Service for speeds up to full gigabit. *Terms: Pricing shown is for 2 year commitment term. After 2 years you can renew for current promotional rate or continue MTM at MTM prices which are typically 10-30% more. Distance, trees, extreme weather, interference and other factors out of our control can affect the maximum or average speeds you will receive. Not all speeds available at all towers. What is Dedicated Air Fiber Internet Service? 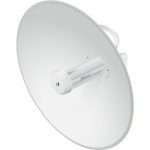 This Enterprise grade Internet access service provides a dedicated fixed wireless frequency or optical laser connection between one of our towers and your location providing fiber optic like service at cheaper prices with dramatically faster installation times. Includes 5 useable static IP’s (or more upon request), unlimited traffic, and top priority traffic and support, Full Service Level Agreements and a standard Gigabit Cat6 Ethernet handoff. Available in most of our urban coverage areas and some rural areas (see coverage map). Good for up to 500 computer networks. *Not available to all locations and cost may vary due to limited space on towers or limited frequencies in a particular area, but we try our best. Please contact us for a free quote and link analysis. Wireless point to point (aka site to site) links are a cost effective way to get reliable high speed Ethernet networks connected between locations that are hundreds of feet or miles apart to extend your LAN, WAN or share your Internet connection. 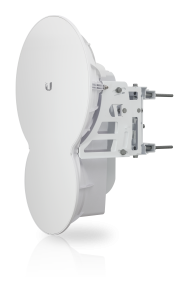 If your locations have clear line of sight between them you can get an affordable Wireless or Laser PTP backhaul to link the the ethernet together at prices that are far less than trenching or paying a telco for fiber. Across town, across your property, across the highway or road, all are great candidates for Wireless Point to Point microwave systems in the 5Ghz, 11Ghz, 18Ghz, 24Ghz, 60Ghz, and 70-80Ghz bands. 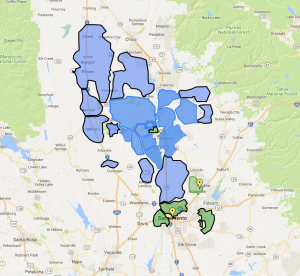 Succeed.net uses all the latest model top name brand equipment and has 15+ years experience since we use these systems for our 100+ tower Wireless ISP network in the Sacramento Metro area. Equipment is 24/7 monitored, firmware upgraded, and extended warranty for life of account which includes any maintenance as needed to keep it performing at top speeds and reliability. For special needs such as wireless rings, super long ranges, or projects let us know and we can provide a custom quote. Note: Each location must have completely clear line of sight between each side to qualify for this service. Normal roof or eve mounts are included, but roof jacks (if needed) on flat roof commercial buildings are not included and are handled and billed separately by a roofing company. Some locations may need small towers to connect which is available at an additional cos (quoted on case by case basis). Speeds are the max possible and you may experience less depending on the distance between the locations, type of traffic (small or large packets), interference, or other factors such as rain, hail, or snow. Everyone with Internet access needs an indoor WIFI access point for wireless connectivity for desktop computers, laptops, cell phones, tablets, TV’s, Playstation, Xbox, and more! So if you aren’t a techie or just want someone else to setup and maintain your in-home WIFI we can do that for you! Want to save $10 a month and do it yourself? 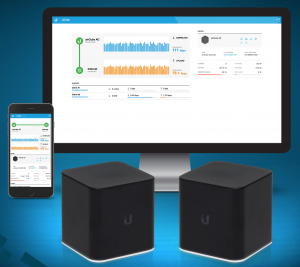 BEST -> Linksys Velop Tri-band – $299 (Amazon) for 2 Meshing units (good for up to 4,000 sq ft, get 3 unit bundle for 4000-6000). Has Parental controls for limiting kids access. Our new customers typically save 50% or more on their telephone bills! Full Features at base price: Full Auto-attendant, Voicemail, Fax to and from desktop, conferencing, follow-me-find-me, group queues (such as sales, support, billing) and more! No long term commitments – Most accounts available with no contract! Infinitely expandable – One phone at a time, it only gets cheaper the more phones you get. 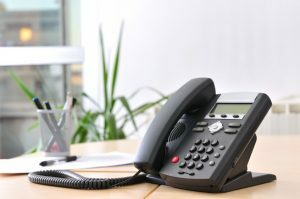 Connect any standard telephone handset, cordless phone, etc and get the great pricing of VOIP. Caller ID, Call Forwarding, etc. 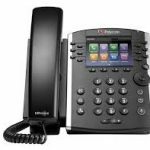 Full Virtual office phone system you can buy per seat, can scale up to hundreds of handsets, receptionists, conference rooms, etc. Full featured eFax service to replace your fax machine with a digital solution. What is Succeed.Net’s MyVoice Business Telephone Service? Succeed.Net MyVoice Hosted is a full featured advanced cloud-based hosted business VOIP phone system designed to save your business money, time and be worry free. HD quality voice, simple interfaces, and advanced features make everyday telecom easier so you never have to worry about anything other than your core business. Our system is a full enterprise grade telephone system that we host in the cloud that replaces any phone system you have. It is constantly upgraded for maximum security, privacy, and new features. 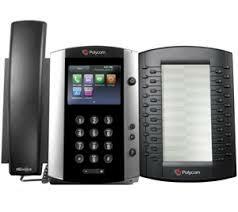 It has all the features of a traditional business PBX phone system. It is sold “per seat” (aka per user that has a phone at their desk). 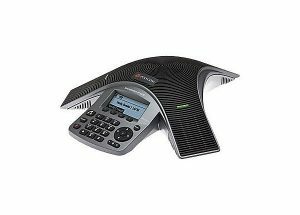 Each seat includes an Enterprise grade VOIP phone and and all base phone features. Each users phone number is only $5 per month (if desired) and you do not need roll-over phone numbers. Even if you have many phones and one phone number you can have several people on hold or on conference calls on each phone and still another caller to that phone number will not receive a busy signal. Legacy phones use the familiar RJ11 phone jack to plug into and legacy analog phone equipment includes the phone number at very competitive low monthly fee. *Prices shown do not include any applicable taxes. Pricing and packages may change. Succeed.Net services are subject to our Terms and Conditions and other applicable acceptable use policies. Call for details, availability, minimum system requirements, pricing and service. 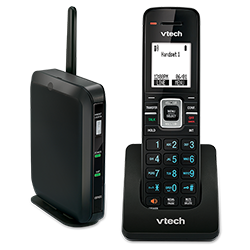 New phone handset included – New cordless home phone included for instant usability. Compatible with any internet broadband connection that has ethernet connection, you could even travel with it. 30 Day Money Back Satisfaction Guarantee – No risk to try us out! Quit anytime. e911 emergency service compliant – You enter your address where the device is located and can update if moved. Succeed.Net MyVoice is an advanced cloud-based VOIP telephone service designed to replace your expensive copper based analog telephone line with a full featured digital version that works over your internet connection. This service should save you a significant amount in telephone line charges while still working with your normal phones (corded or hands free wireless). With the big telephone companies raising prices yearly to ridiculous levels of $50+ per month not including long distance, we have a high quality bargain for you at 50%+ OFF big Telco prices. *Prices shown do not include any applicable taxes. Succeed.Net services are subject to our Terms and Conditions and other applicable acceptable use policies. Well above the flood plain (on 2nd story) unlike Natomas data centers. Host your server at our small but powerful 1100 sq ft private downtown Sacramento Datacenter located at 1112 I street, Sacramento, CA. We are in an on-net building for major Internet providers (AT&T, Sprint, Integra) and can offer up to 10 gigabit internet connections. Super clean office, well maintained and equipped with 24/7 access. This is not in a shared space inside a larger datacenter. We have customer with HDTV antennas on our roof, Wireless Point to Point backhauls, email servers, application hosting, cloud providers, and more. 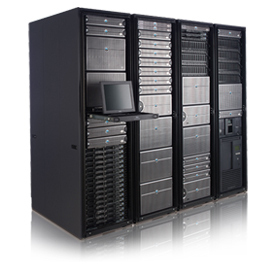 You can host (Colocate) servers of all shapes and sizes, they do not need to be rack mountable. State and local agencies, as well as many web companies rely on the our Server Colocation facilities. Consider Colocation as the most cost-effective way to serve the large databases, web applications, and large web sites to your clients. Host your own dedicated internet server with us, get a new server from us (buy or rent), or let us convert your Windows or Linux server to a VMware virtual server on a redundant system. Our colocation prices INCLUDE Shared 100Mbit static IP Internet access! Onsite Server and Network Engineer – $100/hr for Windows or UNIX server administration, help with reboots, drive swaps, power cycling equipment, troubleshooting OS problems, etc. NOTICE: Spammers, scammers, any illegal content or use, are not welcome. We only are looking for respectable IT businesses and professionals like ourselves. We offer control panel hosting powered by the latest versions of cPanel and Parallels Plesk. running on latest gen VMware ESXi servers running SSD RAID’s (Solid State Hard drives) . All email and web hosting are physically located in our private Sacramento, CA Datacenter at 1112 I street. Register or transfer a domain name to Succeed.net and get consolidated billing with our other services. We offer competitive prices and easy ordering. Full DNS control panel access to your account online 24/7. Private Redundant DNS servers in different geographic areas across the USA.